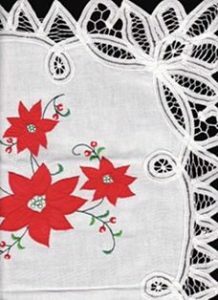 This Pure White Cotton place mat with Battenburg Lace is tastefully decorated with red poinsettia. 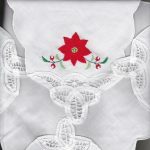 The crisp Red & White table setting will transform your well prepared dinner into elegance and sets a cheerful tone to a festive holiday celebration. 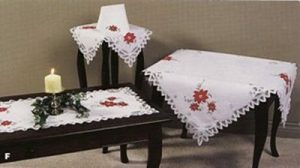 Available in Oblong size. 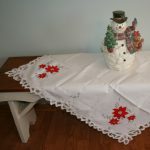 Classic Red Poinsettia appliqué on pure white cotton fabric with fully edged Battenburg Lace table place mat is the crown jewel of festive setting this holiday season for a very affordable budget. 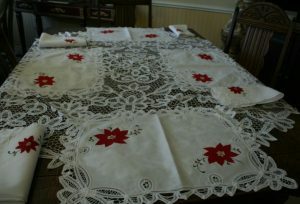 Battenburg Lace TRIM edging and/or lace insertion.